BBC News - Julius Malema: Genius, clown or fat cat? 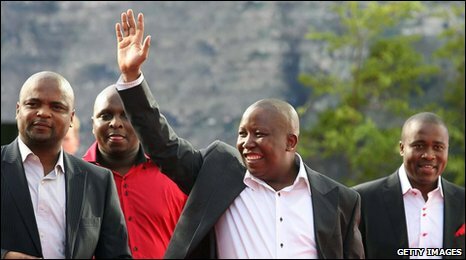 Julius Malema: Genius, clown or fat cat? The controversial leader of the African National Congress's youth wing divides opinion, for some he is a symbol of the corruption for which the ANC is becoming notorious. He is 28, a little overweight, impeccably dressed, and rather fond of referring to himself with the royal "we". He is also, without doubt, the most divisive, the most ridiculed, and for some, the most alarming public figure in South Africa today. Julius Malema is president of the youth league of the ruling party. Not the most powerful of jobs, you might think. But Mr Malema has a genius for publicity, a knack for articulating the anger of millions of impoverished South Africans, and an unnerving ability to give offence. He has threatened to kill for President Zuma. He has accused a provincial leader of sleeping with her entire cabinet. His many critics are branded racists, counter-revolutionaries and colonialists. For some he is a clown or merely a political puppet. For others he is the voice of the voiceless. "He's just embarrassing," said the check-in man at South African Airways. I was flying from Johannesburg to Durban earlier this week. Mr Malema was, as usual, all over the front pages, this time because of allegations that he has been abusing his position within the ANC to win lucrative government contracts for several private companies that he runs, or used to run. Was this champion of the poor, this street-fighting son of a maid, really just another fat cat? It is a familiar allegation here. The ANC is becoming notorious for corruption, so much so that a lifestyle audit has been suggested as a way to find out which officials are living too obviously beyond their means. Mr Malema has been defending himself with his usual vigour, mostly by changing the subject and playing the race card. White kids, he said, are driving around his neighbourhood in expensive sports cars. 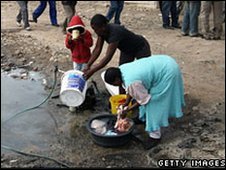 But if a black kid becomes wealthy, people assume it is the result of corruption. Mr Malema has declared he is the victim of a political conspiracy and a racist plot. At the airline check-in desk, the black official shook his head. "I vote," he said. "But I have lost faith in all our politicians." I was heading to Durban to see how the city is coping with final preparations for the football World Cup. There are just over 100 days to go now. 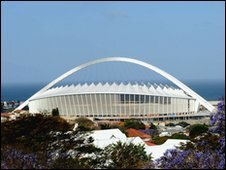 Durban lacks the bling of Cape Town, but it is a beautiful port, with surfing beaches and a new, quite spectacular stadium looming over the city centre. It has a giant white arch over the top, and you can take the train to admire the view. I did so with the city's manager, or chief executive, Mike Sutcliffe. "Look around," he said, gesturing at the building work going on far below us, and all around the city. "We are transforming this city," he said. at least we're talking about it." The talk turned, almost inevitably, to Julius Malema. Plenty of white people in South Africa find him particularly unnerving. They see him as a tyrant in the making, the man who will confirm their worst fears (or prejudices) and turn this bountiful country into yet another Zimbabwe. Mr Sutcliffe begs to differ. He is a veteran of the ANC, a man who helped fight for democracy here. He sees Mr Malema, his outbursts and the negative media coverage they attract, as proof that democracy is flourishing. That free speech and a free press are now entrenched. A crowd of black school boys spotted Mr Sutcliffe admiring the view and asked to have their photo taken with him. A short while later, I was sitting in the harbour having coffee with a prominent black entrepreneur. Let us call him Martin. Democratic South Africa has been good to him. He has got a house in the hills, with a motorboat parked in the front drive. He is also poised to do rather well from the World Cup, but, he said quietly, "not half as well as the corrupt insiders with political connections". "That's true in most countries," I suggested. and the stakes are so much higher." Martin went on: "I'm an independent entrepreneur. I'll be fine, but Julius Malema is just a symptom of a much bigger problem. Unless we have a proper democracy, and proper accountability, we're going to be in big trouble soon." I flew back to Johannesburg in two minds, or more - an occupational hazard in this wonderfully, maddeningly contradictory country. Julius Malema had just been to a local radio station to protest his innocence yet again. The talk show host asked why he had driven to the studio in a white Land Rover Discovery with no license plates, a car he has been seen in more than once. Mr Malema pointed out that it was not his vehicle and he was not driving. "This is not a banana republic," he said. "If there is any wrongdoing, let Malema be locked up."